We often get requests for Diamond Wedding cards so here is a design to join our other wedding anniversary cards. It is worked in shades of pale and metallic blue to give a subtle sparkle. 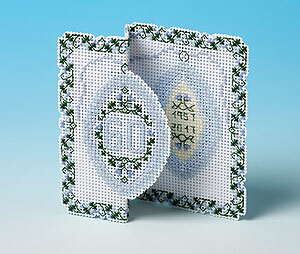 These cards are often worked for special birthdays as well. Kit contains stitching paper, backing card, stranded thread, envelope, needle, chart and full instructions.